Sure, it seems like a new restaurant pops up nearly every week in New York. And with the constant openings and closings and general turnover of the restaurant industry, it can be hard to keep up. But we've actually been waiting a long time on this particular restaurant to make its New York debut, and now — it has finally arrived. Welcome to the Big A, Umami Burger. From the West Coast to its latest location in the West Village, Umami's gourmet burgers are something of a legend. What we adore even more about Umami? Its select menu doesn't overwhelm us with too many choices. We're talking approximately 10 burgers, including a truffle burger, a tuna burger, and some that have been custom created for New York, like a duck burger and a French-dip sandwich. The 128-seat, two-story restaurant is now open, and yes, there is a full bar. 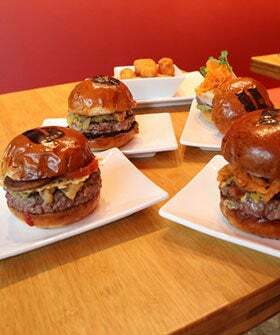 Umami Burger, 432 Avenue of the Americas (at 10th Street); 212-677-8626.